The harbor at Stonington Maine on Deer Isle. When author John Steinbeck visited Deer Isle while he was writing Travels With Charley, he noted that, “We do not take a trip, the trip takes us.” Steinbeck wasn’t the only one to notice this island’s unique, atmospheric charms; Deer Isle has inspired many artists over the years, from painters Fairfield Porter and John Marin, to musician Dan Fogleberg, architect Frederick Law Olmsted, and authors Robert Massie, Cynthia Voight and Robert McCloskey. But the Deer Isle-Stonington area has long drawn adventure seekers and vacationers, as well. Following in the footsteps of early Portuguese, French and English explorers, European settlers arrived in the 1760s and Deer Isle was incorporated in 1789. The granite industry flourished over the next century, and the towns of Isle de Haut and Stonington were incorporated in the late 1800s. Today, this 24,000-acre island’s many cultural, historical and recreational attractions attract tourists to its scenic, 112-miles of shoreline year-round. Stonington sits on the southern end of Deer Isle and includes the villages of West Stonington and Oceanville. 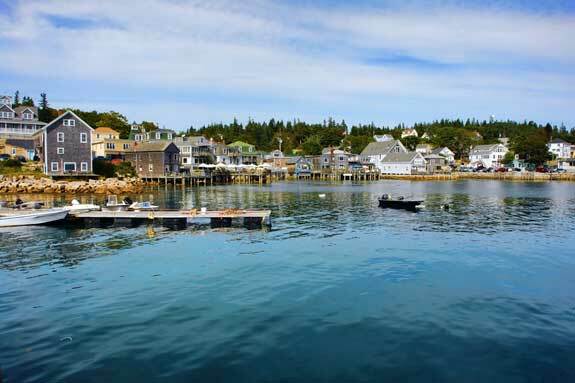 Long a center for shipbuilding, fishing and maritime activity, this picturesque town offers harbor views and plenty of water sports, from sailing to sea kayaking. For that quintessential Maine photo opportunity, stop by the Mark Island Light. Also known as the Deer Island Thorofare Light, this 25-foot-tall brick lighthouse has been guarding the coast near Stonington since 1858. Take in some local culture at the Stonington Opera House. Since 1912, this historic institution has offered a schedule of theater, dance, musical and film performances. For a dose of history, stop by the Deer Isle Granite Museum. Open in July and August, the museum features a working recreation of the nearby quarry on Crotch Island that produced the pink granite used in landmarks such as Rockefeller Center, the George Washington and Manhattan bridges, and Arlington National Cemetery. Named for the lovely blue-purple wildflowers that cover the island, June’s annual Lupine Festival heralds the coming of spring. In Stonington and other venues throughout the island, visitors can attend garden walks, craft fairs, sailing tours, food events and live performances. July visitors won’t want to miss the annual Stonington Lobster Boat Races and Fisherman’s Day. These maritime-themed events offer fun, food and competitions for the whole family to enjoy. One of the best places to learn about Deer Isle’s past is at the Deer-Isle Stonington Historical Society’s Museum and Archives. The museum features a restored 1830 home, a research library and exhibits, artifacts and photographs from the region. For more history, stop by Scott’s Landing, an old farmstead that’s now crisscrossed with nature trails and lots of bird watching spots. The landing is one of the 12 Deer Isle preserves maintained by the Island Heritage Trust, many of which offer trails, beaches and scenic views. Another popular nature trail is in Crockett Cove Woods, a preserve that encompasses 98 acres of thick fir and spruce forest and wildlife habitat. For more outdoor recreation, play at the nine-hole course at the Island Country Club in Sunset. It’s open to the public from May through fall. Artists and art enthusiasts won’t want to miss the internationally renown Haystack Mountain School of Crafts. This institution has been offering workshops and classes in a range of art forms, from dance to basketry, for over 50 years. Other don’t miss attractions in Deer Isle and the nearby town of Sunset include the annual Lighthouse Trail Weekend. Each fall, local artists, stores and restaurants join to celebrate the region’s scenic and historic lighthouses with exhibits, tours and performances. Also in fall, the Peninsula Potters Tour – held each year over Columbus Day Weekend – allows guests to visit working potters’ studios. Even in winter, Deer Isle likes to throw a good festival. At Christmas, a boat decorating contest brings out creativity, while the last weekend in January is transformed by the fun of Winterfest. In May, the Wind, Waves and Wings event celebrates the feathered residents of Deer Isle with guided bird walks, special art showings and food events, all centered around the eagles, puffins and other birds that call the area home. Deer Isle visitors will appreciate the range of lodging options available, from cozy country inns to quaint seaside cottages, lovely bed and breakfasts and family-run motels. The local cuisine is sure to tempt any palate, with offerings from gourmet eateries to fast-food joints. Just don’t miss out on that famous fresh Maine seafood! Visit the following directories to find lodging, dining, attractions, shops, services and recreational activities in the Stonington, Maine area.